Zoom Rooms is a software-based room system that is revolutionizing the way businesses use their meeting spaces. Zoom Rooms supports flawless, high-quality video and audio conferencing and content sharing with up to 1,000 interactive video participants. A Zoom Room can be any type of space – from huddle rooms to large training rooms (we’ve even seen them in trailers and ranches!) – and can connect to any device, including mobile, desktop, and other conference room systems. And one of the key benefits of being software-based is our ability to stay agile, focused, and dedicated to constant innovation. On January 31, 2019, Zoom pushed a new release for Zoom Rooms that enhances the experience for all our customers. I’d like to share with you some of my favorite new features. Zoom Rooms now provides one-touch to join a meeting with HD audio and video for Webex, Skype for Business, and GoToMeeting invitations. What you need: Make sure you have at least one Conference Room Connector license (for interop support) in addition to the Zoom Rooms license. The third-party meeting invitation will also need to support interoperability. 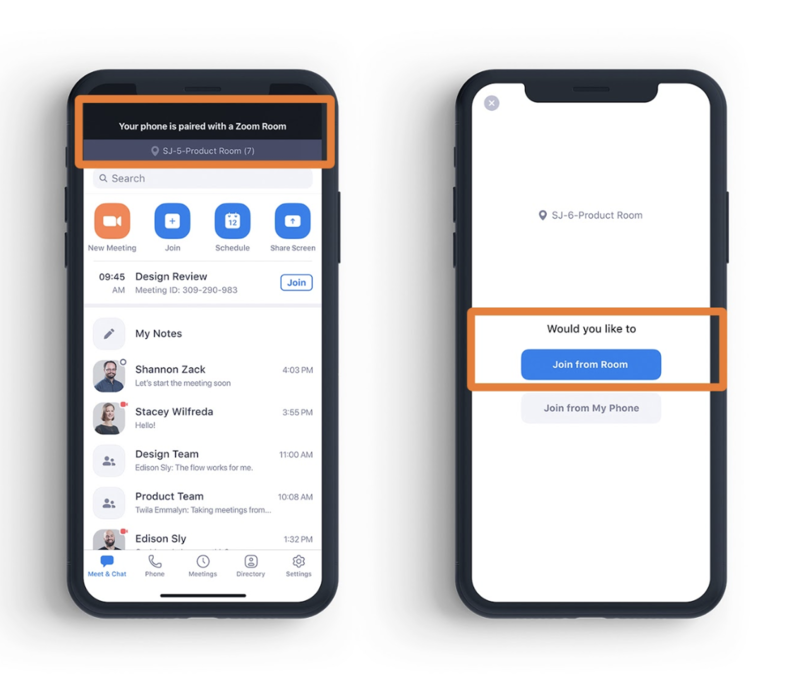 Why it’s awesome: Zoom now makes it easier than ever to seamlessly support multiple meeting services for your conference rooms. This is especially useful for organizations looking to transition to Zoom where other legacy services may already exist. Now you can easily start a Zoom meeting from a Zoom Room using your mobile device. When you walk to the nearest available Zoom Room, your Zoom mobile client will use proximity detection to identify and automatically pair with it. 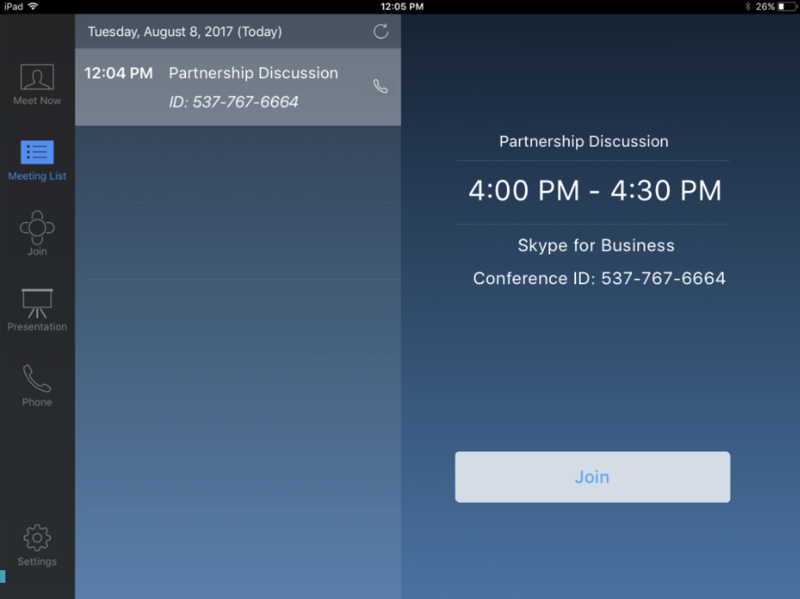 You will then have the option to start the meeting in the Zoom Room or take the meeting from your iOS device. What you need: Make sure you have the latest Zoom mobile client installed on your iOS device. You’ll also need to have a meeting scheduled with a Zoom meeting on your calendar. Why it’s awesome: If you forget to book a room and are able to spot an available space, you can easily start or join the meeting in the Zoom Room from your mobile device without punching in the Zoom meeting ID. The new mobile client now includes a “Share Screen” button to allow wireless proximity sharing from your mobile device. 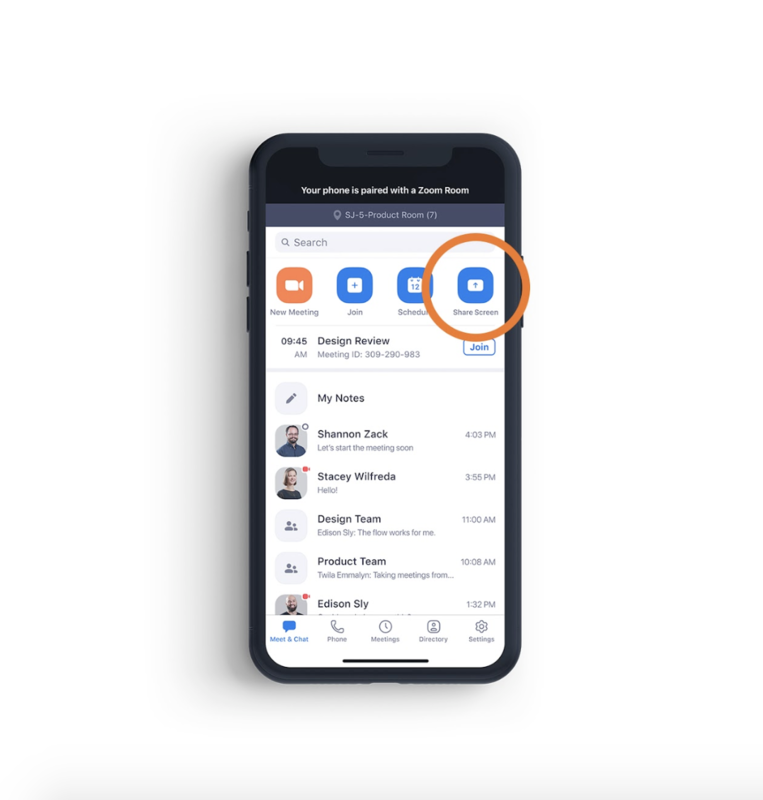 What you need: Make sure you have the latest Zoom mobile client installed on your iOS device and that your device settings permit you to share content. Your device will guide you on how to do this when you do your initial “Screen Share” attempt. Why it’s awesome: Just like on your desktop device, we want you to be able to seamlessly share content in Zoom Rooms. We’ve already given you wireless sharing from mobile devices into your Zoom Rooms, so now we’ve just made it easier and have provided a more consistent experience across our mobile and desktop solutions. Zoom Rooms for Touch, our video communications solution for interactive room displays, now allows you to have multiple whiteboards. 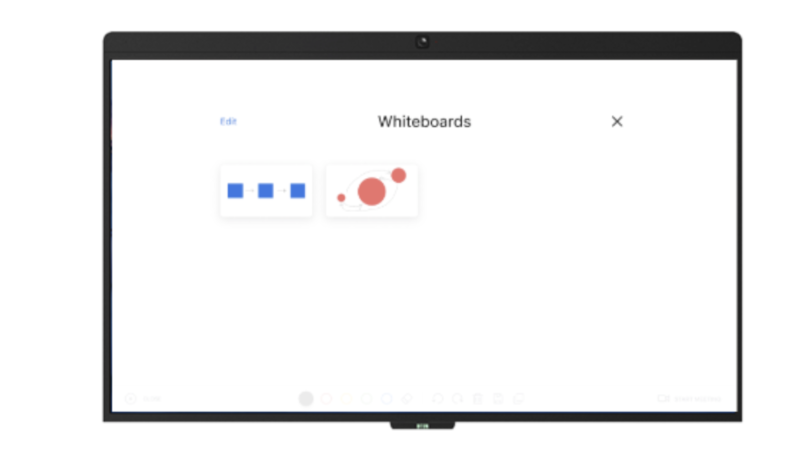 With this new enhancement, you can co-annotate across up to 12 different whiteboards with mobile, desktop, and other Zoom Rooms for Touch participants. What you need: Make sure you have an interactive display to power Zoom Rooms for Touch along with the other core components needed. We recommend the DTEN D7 as an all-in-one solution with pre-configured Zoom Rooms software. It’s a plug and play solution that works right out of the box! Why it’s awesome: Interactive whiteboarding is one more way to enhance collaboration by combining the power of video conferencing and co-annotation. By supporting multiple whiteboards, you can better organize your teams’ thoughts and ideas and keep your meetings productive. You can also save the whiteboards and have them sent as attached images to the email address of your choice. To get a full list of the Zoom Rooms enhancements in the latest release, visit our release notes here. To get the latest Zoom Rooms software, you can either update your rooms from your Zoom Admin Portal or you can download the software here. 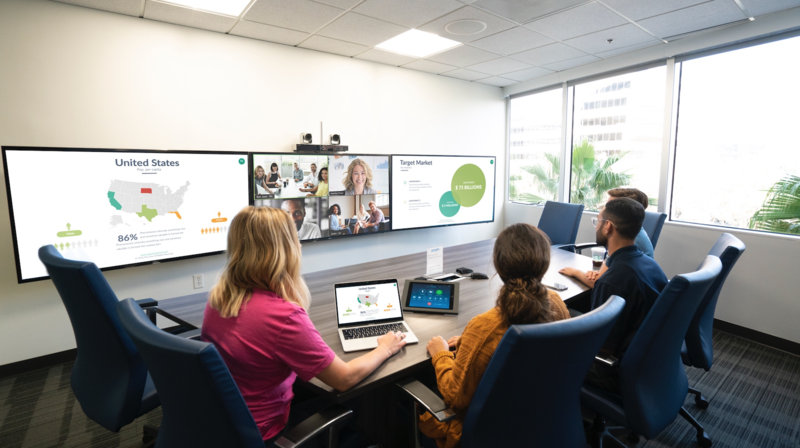 Zoom will continue to release new features and enhancements that make video conference room deployments frictionless while making sure employees are getting enterprise-grade solutions to streamline their workflows and have more meaningful engagement with their teams. You can bring the power of frictionless video communications into your meeting rooms. With Zoom Rooms, transform any space into a modern, easy-to-use, and powerful collaboration hub. Our product specialists would be happy to provide a virtual demo of Zoom Rooms – sign up today!